Over at Papertrey Ink, it's all about interactive cards this month - including the Blog Hop Theme! I decided to create an "easel card", because I've seen a few of them around (most recently, this cute card on Ted's blog), and I had a vision that involved using the Poppystamps Window die that I recently purchased. :) My new PTI order arrived while I already had this card in progress (can't wait to play with my new zippers and sliders dies and Movers & Shakers set! ), so I used my brand new Lovely Leaves stamps to make the pretty little tree branch behind the window. :) The window is popped up on the base (which is layered with a piece of the new Aqua Mist patterned paper), with the tree image on white cut to fit just behind the window. My color scheme is Aqua Mist and Canyon Clay, with a little bit of Hawaiian Shores, Spring Moss and a touch of Raspberry Fizz thrown in. Here is the front of the card: The Canyon Clay rectangle mat is only attached to the lower 1" of the card front, below a score line in the front panel. When you open the card up, this is what the inside looks like. The inside of the card is created on a 4.25"x2" strip of Aqua Mist, which I scored and folded 1" up from the bottom. This piece is attached to the inside of the card, with the lower 1" adhered and the upper 1" able to fold up. I stamped Spring Moss with Polka Dot Basics 2, and then used a border punch to punch 3 layers of grass, which are layered together and adhered to the "flap", and then I used various flower die-cuts from the Flower Fusion series and adhered them, tucked down into the grass. The sentiment is stamped on the label die-cut and adhered to the lower part of the inside flap. How cute is THAT? :) Here are some more angles to get a view of how the whole mechanism "works". Well, this was a fun challenge - thanks PTI! I can't wait to make some more fun, interactive cards with my new PTI goodies! Fabulous design and colours, Debbie! How fun! Love the colors and the little scene in the window. This is an awesome interactive card Debbie! Thanks for posting all the angles so we could see just how great of a card this is!!! Very, very cool card! You've provided so much beautiful detail, in an obvious labor of love- just wonderful! Wow! How beautiful and fun! Thanks for showing all the great details! oh my goodness!! how stinkin' cute is that?! wow. great job! That is really cool! I love this card! This is awesome, Debbie! I would love to get a card like this in the mail--it's a gift in itself! Super clever! so cool. I love that window die! Lovely card.Love how it looks like a flowerbox under the window when it is used as an easel. I must learn how to do this. So sweet! I really love the gingham "wallpaper" and polka dot grass! So cool! I'm definitely saving that trick in my mental rolodex! Awesome card Debbie! Get out of here! This is just the best card! Cant wait to see if I can make one like this. I love my window die too. TFS this amazing card! What a happy card to receive! Great ideas and fun colors. Gorgeous card! love how it looks inside! WOW, Debbie, this is soooo cool. 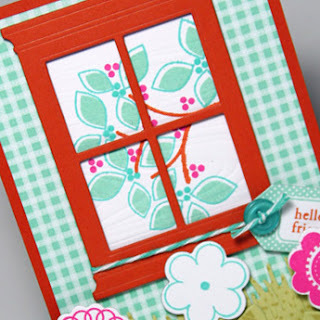 Lovin' this window die and your choice of colors ~ just fabulous! Love it! I have never seen an easel card done that way. Will have to give it a try now. Such a gorgeous card. It's literally beautiful iside and out. Now THAT is a cool interactive card!! And you didn't need any movers and shakers dies to help you...I'm so impressed!!! Wow, this is really a beautiful, interactive card. The recepient will nevre tire looking at it. Thanks so much for sharing! I knew I'd see something bright, cheery and beautiful when I came here, and I was right. Your card is stunning. I love all the different pictures you shared, because it gives a little idea of how it all comes together. So sweet! Looks like spring! Beautiful easel card, Deb. Love the bright colors you chose also. WTG! Wow! What a scene you have created with this easel card. Love the colours and just beautiful! Great work, Debbie! Super card and Beautiful! Love how you can make the flowers stand in front of the window. I never would have figured this out without the pictuers! Way to rock out the PTI blog challenge. So very pretty! I like the colors and your planning, the interactive element. This is wonderful! What a fun card, and so pretty too! I love the whole idea of the window with the pop up flowers! Amazing card! Love the whole interactive idea! This definitely goes in my "to case one day" folder! What an absolutely fabulous card!!! I just love the sweet little scene it interactively creates!! So clever and fun!! !